Saran wrap is another product which can be added to the list of accidental inventions. Ralph Wiley was not even working as a scientist when he discovered the substance that would become Saran wrap. In 1933, Wiley was working in a laboratory at Dow Chemical cleaning glassware when he found polyvinylidene chloride, the chemical that would later become Saran Wrap. He came across the substance in a vial that he could not scrub clean. Wiley called this chemical “eonite” after a material in the Little Orphan Annie comic strip. Researchers at Dow turned eonite into a greasy, dark green film. The product was not originally used to wrap food. The substance was used first by the military to protect fighter plants against salty sea spray and then carmakers used it for upholstery. It was not until Dow created a version without the smell and green color that it was used for food protection. Saran wrap will stick to almost any material including itself which makes it the ideal way to cover and protect food. 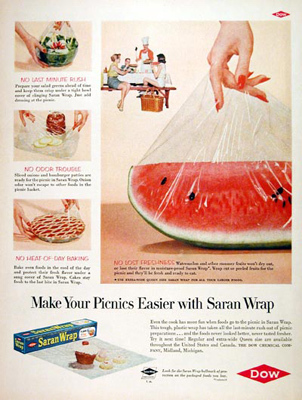 Saran wrap was marketed for commercial use in 1949 and then for household use in 1953. Today, because of environmental concerns about the use of chlorine, Saran Wrap is made of low density polyethylene (LDPE) which contain no chlorine. Ralph Wiley continued his career at Dow Chemical. He went on to become a scientist in the company and receive many patents for the plastic and other chemicals he developed. Saran wrap continues to be one of the most popular ways to protect food and the world still continues to marvel at its adhesive quality. ← Invention Geek – Magic Fingers?